I have been stalking following Alice's blog for a long time, though she may not know, and I adore her CAS style. 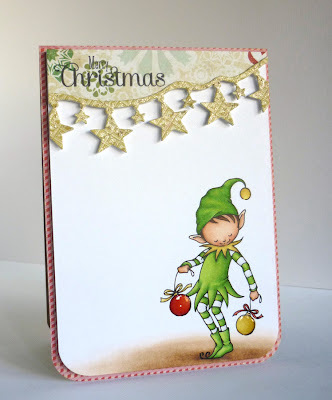 Here is a card she made using Christmas Elf. A lot of white space, a touch of patterned paper and embellishments, and beautiful coloring... That's her style! I love the way she added the patterned paper on this card. Thank you for sharing, Alice. Please stop by her blog to leave some love for her!